In 2012 Shoreline Marine Fabrication won a tender bid to design, construct and supply a large mono-hulled patrol vessel to the Western Australian Police This vessel is intended to replace police vessel Falcon as an offshore patrol vessel over 15 metres. The Police vessel will be required to undertake a variety of tasks in the entire range of offshore policing requirements under all weather conditions. 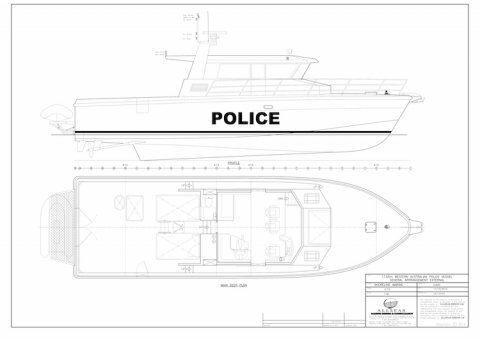 The design of the vessel required a complete understanding of the functions, duties/abilities, restrictions and operating areas of Western Australia Water Police, and to meet the business requirements of WA Police. Simplicity combined with proven and demonstrable quality design and equipment are essential elements that went in to making this vessel function in circumstances and conditions most vessels would not experience. Further to this, the hull design must be a proven and demonstrable design within Western Australian, or similar, offshore waters. Compliance is a major priority of the build and supply of this vessel for our clients. The vessel is being built to comply with all relevant sections of the Western Australian Marine Act 1982, as applied to a class 2B vessel operating up to 200 nautical miles (NM) from the mainland coast of Western Australia. The construction of the vessel and materials used fully comply with the legislative requirements of the combined USL/NSCV for a class 2B vessel.